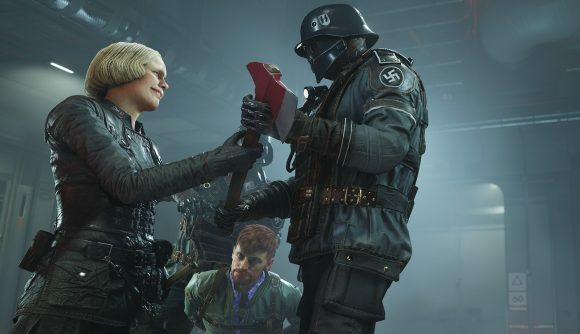 A long-standing German law that bans symbols of the Nazi party and other hate groups has been relaxed enough to allow the images to potentially appear in videogames sold in the country. German law has allowed for exceptions to the ban on Nazi imagery for educational and certain artistic purposes, but until now, that exception – called the social adequacy clause – only applied to film, literature, and other art. Games never qualified for the exception, because Germany did not legally recognize games as art. That seems to have changed, and now the USK, Germany’s software ratings body, can cite the social adequacy clause when making ratings decisions for games and potentially sign off on games that use previously banned imagery. The USK is careful to point out that the exception isn’t general and that the underlying criminal code hasn’t changed, and that each piece of software that uses Nazi (or neo-Nazi, or Ku Klux Klan, or other designated groups) imagery will be evaluated on its own merits. That could make it a bit easier to get games on retail shelves in Germany. Up until now, games publishers have had the choice of either making major changes to their games’ content or forgoing the largest games market in all of Europe. Many have opted for the former, with Hearts of Iron IV casting an obscuring shadow over Adolf Hitler’s character portrait, or Call of Duty: World at War completely removing the zombie multiplayer mode from the German editions. It’s not clear yet how the newly-interpreted social adequacy clause will be used by the USK, or if games that have previously been censored under German law will have the opportunity to patch in missing or altered content for the German audience. The German Games Industry Association, “game,” praised the move, saying it will allow games to finally “play an equal role in social discourse” and be treated equally alongside other forms of media.